You have asked me often for the tale of our first meeting, and how my association with Feximal came about. I have always declined, because it is a story too private to be truthfully recounted and a memory too precious to be falsified. But none knows better than I that stories must be told. 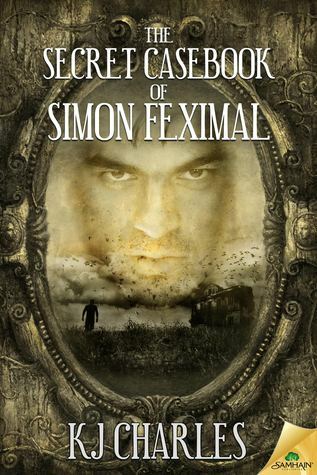 I can’t believe I’m saying this I like it, but didn’t love The Secret Casebook of Simon Feximal by K.J. Charles as much as I normally do her stories. I did not feel like the two mc’s were connected enough for me. I liked some of the stories, some were clever to read about, and a few had me re-reading the sentences to make sure I was reading them right. I’m pretty sure I was confused about the Pieball story, as well as the Priest story. I got it, but all the words in my head were not making sense at all. As usual K.J. Charles has some memorable characters. I love reading her books, she gets the time frame, setting, and linguistics down packed every time. I liked the anthology style writing that was presented. We have Robert Caldwell who decided to write a short book in the 1900’s based on his experience with Simon Feximal the ghost hunter extraordinaire. From that first meeting to their presumed death was illustrated. It brought forth the introduction of numerous characters, some stand outs like The Fat Man<–*Swooning, Mycroft Holmes is the S***, the Diogenes Club, Miss Kay, Mr. Silence, and the utterly disgusting Mr. Park, and Dr. Berry. I thought the cast was good, and some of the stories were scary. This is classified as romance and I felt like the relationship between Simon & Robert was nowhere to be found. I was underwhelmed with them. I don’t know if it was the nonexistent communication or the lack of love, but I was not into them like I found myself with her other characters from previous novels. Of course I’ll continue to read Charles’s writing, one not so good book does not disqualify her from being one of my favorite authors writing one of my favorite genres. Cover Art by Kanaxa: I thought the cover is fitting. It’s the beginning between the two mc’s. The mirror is an important factor to Simon, as the house is important to Robert. I liked the cover; it definitely keeps up with the book setting as well. The Caldwell Ghost and Butterflies are previously published short stories. The Secret Casebook of Simon Feximal continues and completes Robert Caldwell and Simon Feximal’s story with primarily new material. Contains a foul-tempered Victorian ghost-hunter, a journalist who’s too curious for his own good, villainy, horror, butterflies, unusual body modifications, and a lot of tampering with the occult. This entry was posted in Book Reviews, Books, eBooks, LGBTQ Book Reviews, M/M Book Reviews, M/M Fiction, M/M Paranormal Fiction, M/M Romance, M/M Supernatural Fiction, Uncategorized and tagged A Mika Review, author KJ Charles, Samhain Publishing, The Secret Casebook of Simon Feximal by K.J. Charles.